Craigie House, in Ayr, was built around 1730 as a replacement residence for Sir Thomas Wallace of Newton Castle. 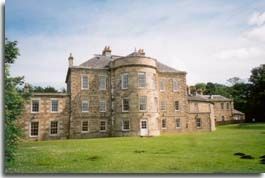 The estate was bought by William Campbell in 1782, remaining in that family until purchased by Ayr Town Council in 1940 for £12,500. Craigie mansion house is now used as a management centre for Paisley University. The grounds of Craigie stretch from Ayr town centre, behind Ayr College, east alongside River Ayr. The gardens and scenic walks are open to the public all year round.